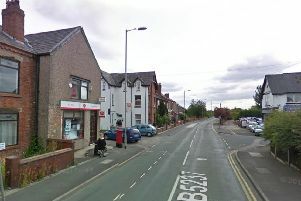 A burglar said he ransacked a Wigan social club because he was turfed out of prison with just a fiver in his pocket. Persistent thief Clifford Faulkner is now beginning a fresh 16-week jail term after pleading guilty to the break-in at Whelley Labour Club. Neighbours raised the alarm after hearing noises at the Northumberland Street venue, Wigan justices were told. And when one nearby resident went to investigate she found the club’s window smashed and came face-to-face with Faulkner. Katie Beattie, prosecuting, said the intruder could be seen throwing items through the window, including bottles of spirits and a cash register. The police arrived a short time later and found Faulkner around 50m away from the scene, she added. Not only did he match the description of the burglar but he also had a cut to his thumb and there appeared to be shards of glass attached to his footwear. Ms Beattie said that when he was arrested and interviewed, the defendant said he had been released from prison a short time beforehand, with just £5.20 to his name. “What did you think was going to happen?” he was said to have asked police. The court heard he admitted that he was homeless and had been seeking money so he could go and buy drugs. The club steward confirmed that a number of bottles of spirits had been smashed, as a result of the break-in and it would cost more than £400 to board up and repair the window. Faulkner, of The Grove, Higher Ince, who admitted burglary, has 33 previous convictions for 74 offences. Faulkner was a “revolving door recidivist” caught in a spiral of offending and jail time. But magistrates ruled he should be jailed as he had a “flagrant disregard for people and their property”, having only just been released from prison. He was also ordered to pay £500 compensation.